Trouble is, comparing spring rates between different cars is useless. That’s because it’s the wheel rates that matter, not the spring rates. Confused? Let’s take a look at the relationship between spring and wheel rates. Most springs are linear devices, so if you double this mass, the spring compresses by twice as much. Wheel rates are expressed in the same units as spring rates. For example, say the car weighs 3000 pounds and this mass is divided equally between all four wheels, giving a static load of 750 pounds per wheel. When you lower the car onto its suspension, you find the wheel rises by 3 inches as it supports the weight. 750/3 gives a wheel rate of 250 pounds/inch. So what’s the relationship between spring and wheel rates? That depends entirely on the leverage ratio built into the suspension. 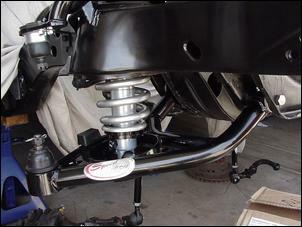 Most suspension systems do not have a 1:1 relationship between wheel movement and spring movement. 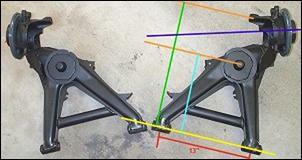 In semi-trailing arms, wishbones, multi-links and many others, the spring:wheel movement ratio is not 1:1. (In strut systems it is close to 1:1.) 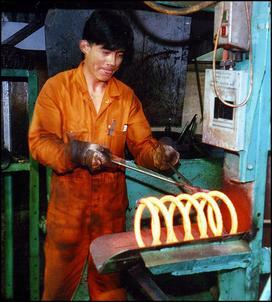 In most cases, the wheel moves further than the spring. The relationship between the wheel movement and the spring compression is called the motion ratio. It can be measured in two ways. The first way is to measure the suspension arm, working out its leverage ratio by looking at where the pivot point is relative to the wheel and the spring. However, it’s easy to make measuring errors in locating the centre of pivot points and complex suspension designs get very hard to analyse like this. A better way is to carefully measure the wheel travel and the spring travel, preferably over small increments. 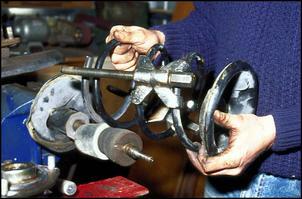 (Remove the spring and/or the damper to do this and use a jack to move the wheel through its travel.) If the wheel moves twice as far as the spring, the motion ratio is 2:1. Note that motion ratios are seldom neat numerical figures like this – it might be 2.2:1 or 1.87:1. The motion ratio might even change through the range of wheel travel and an average may need to be taken. So how do you use this motion ratio to get the relationship in pounds/inch between the spring and the wheel? Here’s the key point: the relationship between the wheel and spring rates is worked out by squaring the motion ratio. So if the motion ratio is 2:1, the relationship between the spring rate (eg in pounds/inch) and the wheel rate (also in pounds/inch) is 4:1 (2 x 2 = 4). If the motion ratio is 1.87:1, the spring:wheel rate relationship is 3.5:1 (1.87 x 1.87 = 3.4969). Taking as an example the motion ratio of 1.87:1 (giving a 3.5:1 spring:wheel rate relationship), a wheel rate of 250 pounds/inch will require a spring rate of 875 pounds/inch. But if the motion ratio is 2:1 (and so the spring:wheel rate relationship is 4:1), the required spring will be 1000 pounds/inch! You can see that small changes in motion ratio make for large changes in the spring:wheel rate relationship. That’s why it’s pointless comparing the spring rates used across different cars – unless of course those different cars have exactly the same motion ratios in their suspensions. If you’re designing a suspension from scratch, keep in mind that while a high motion ratio has some advantages, it will require a very strong spring that will be heavy and, for a given diameter, have less available travel before coil-binding occurs (because of its use of thicker wire). Note that how much the car settles on its suspension will depend not only on wheel rate but also on the spring pre-load, if any. 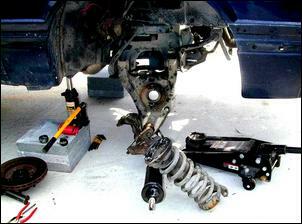 In some suspension systems (eg struts), the springs are compressed and then held captive in that compressed state. Pre-load holds the spring in place when the strut reaches full extension (which occurs when the car is jacked up or the wheels leave the road) but it also means that the car does not settle to the extent that you might first expect when the weight is on the springs. 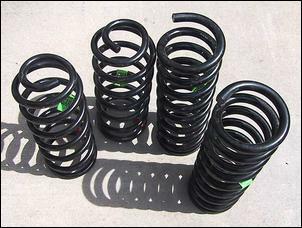 For example, a spring might have a rate of 100 pounds/inch and a free length of 15 inches. When it is mounted on the strut it is compressed to (say) 11.6 inches, and so the pre-load is 3.4 inches. To compress the spring by each inch takes 100 pounds, and so the compressive force acting on the spring when it is on the strut must be 340 pounds (3.4 inches x 100 pounds per inch rate). If there are 665 pounds acting through that corner of the car when the car is stationary, the spring will settle only 3.25 inches, because the first 340 pounds of the car’s weight is needed just to overcome the pre-load. If there was no pre-load, the car would settle by 6.65 inches (665 pounds divided by the 100 pounds/inch spring rate).